Violet was born to adventure in the rugged pampas of Argentina in 1887 – the first child of a young, Irish immigrant couple. She survived the hardships of life on a sheep farm and the loss of her father, all before entering convent school back in England. Violet had grown up hearing her mother’s tantalizing tales of her experiences as a steamship line stewardess. Now, she was determined to follow in her footsteps, but it wasn’t easy. Her young age, Irish good looks and lilting accent had prevented her from finding work – back then, most stewardesses were middle aged women. Finally, at 21, she resorted to trickery to get a job. Wearing no makeup and dressed in a drab, shapeless dress, she appeared to be 10-years older and was hired on the spot. 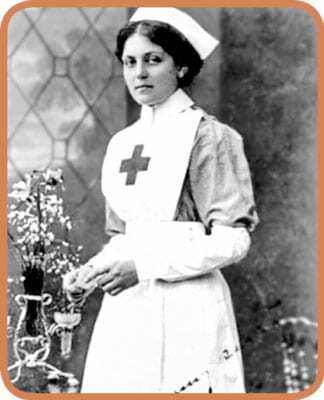 Three years and a few ships later, Violet signed on as a First Class Stewardess aboard Titanic. She was no stranger to passenger ships nor to the challenges of life at sea, both from the natural elements and the elementary instincts of men she encountered. Around midnight on April 14, 1912, she faced the ultimate challenge– survival. With Titanic listing heavily, Violet was directed to enter the last remaining lifeboat and to reassure women passengers that it was safe. She was handed a baby to look after and set adrift in the dark until the good ship Carpathia came to her rescue.